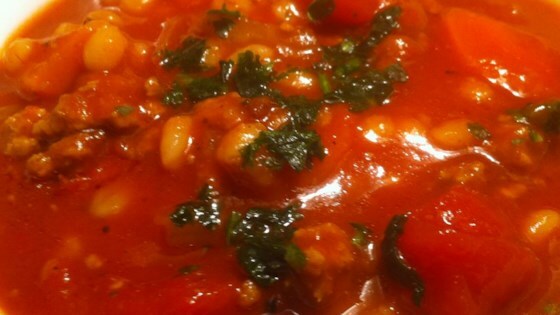 "This is a hearty soup that is good for cold winter days. Lamb and vegetables are cooked in a beefy broth with chewy barley. You can add more vegetables if you like; this is very flexible. Serve by itself or with your favorite main dish." Heat a large skillet over medium-high heat and stir in the ground lamb and onion. Cook and stir until the lamb is evenly browned and onions are translucent. Drain and discard any excess grease. Stir in the tomatoes and their liquid, water, consomme, and tomato soup. Add the carrots, celery, and barley, and season with chili powder and pepper. Simmer over medium heat for 45 minutes. Very, very tasty...my family couldn't stop eating it! I substituted the ground lamb for ground turkey, though.